I find snooping through my friends or fellow bloggers makeup bags is a real incite into their beauty routine. It shows the products that a girl loves so much that she can’t leave the house without them, or perhaps reveals what your conscious of. I think the contents of my makeup bag show that I’m conscious about my brows, or lack of! And also my tendency to get a rather glowing forehead as the day goes on! I’ve recently downsized my handbag so my makeup bag at the moment is this tiny little one which came with the Urban Decay Little Perversions set; it’s very slim so I can easily pop it in my evening clutch bags too. Although I don’t tend to top up my eyeshadow during the day, I have the Naked2 Basics palette from Urban Decay in my makeup bag just in case – the neutral shades have super staying power and are flattering on any skin tone, plus the huge mirror in the lid of the compact means I don’t need to carry a separate mirror with me. Also for the eyes I have a mini tube of the Urban Decay Perversion mascara which came in the Little Perversions kit, for topping up my mascara throughout the day. Although it’s a slim tube, the brush is still chunky, and the stiff bristles coat and separate my lashes, even over the top of the mascara that I applied in the morning. For liner, I’ve currently got the Zoeva Cat Eye Pen in my makeup bag – I’ve raved about how much I love it in previous posts and I find that the super skinny nib makes it easy to just touch up any areas of liner that have faded, or to quickly re-create a sleek flick! For brows, the Rimmel Brow This Way Eyebrow Sculpting set is absolutely perfect for touch ups on the go. It’s a tiny little compact with a wax and a powder, a double – ended brush and also a spooly for combing through wild brows! 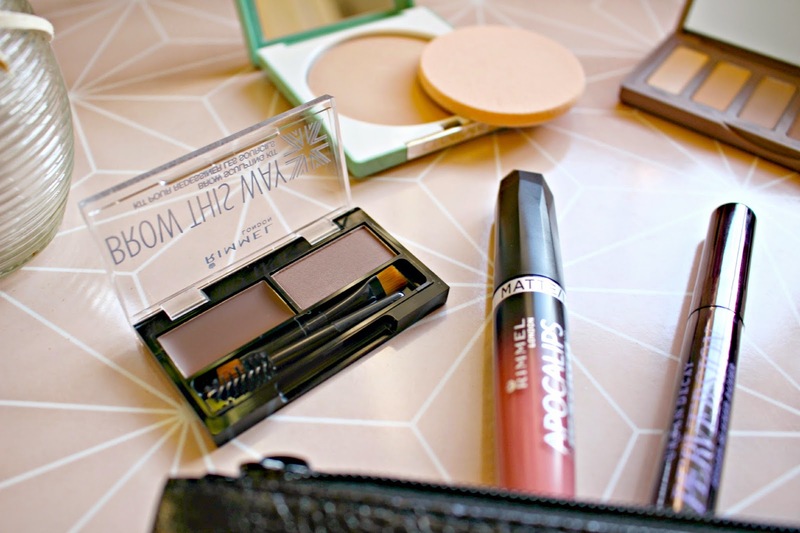 I first use the wax to shape and fix my brows, and then use the precision brow brush to add powder where my brows are a little sparse and also fix the wax. I mostly use the powder when I’m out on the run, but for serious brow SOS, it’s handy to have the wax in this set too. Another Rimmel product in my handbag at the moment is the Apocolips Lip Lacquer in the shade Shooting Star. I’ve been wanting to achieve a vivid satiny colour but with the moisturising benefits of a gloss, and the Apocolips does just that. It also has an easy to use doe-foot applicator, perfect for speedy top ups. I am always switching up the lip product in my makeup bag, but at the moment this shade is exactly what I’ve been looking for; not quite a ‘pretty pink’ and less intense than a deeper plummy shade – I love it! Finally the Clinique Superpower Double Face Powder, it has a hint of coverage but nothing too obvious, but for me, most importantly it gives a matte finish and is perfect for applying in the early afternoon, when my makeup begins to melt. I previously used the Mac Fix+ powder, but found it sometimes made me look too ‘made up’, whereas the Clinique powder gives a far more natural, shine free finish. 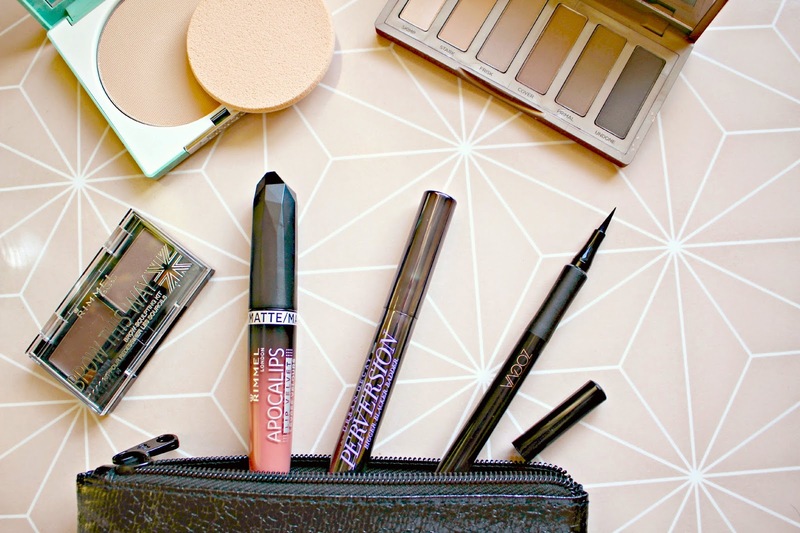 Do you have any of these products in your makeup bag? What are your essentials?